The File Manager interface, like all 'Manager' plugins, consists of two parts, the File Browser section, where files are uploaded, manipulated and selected, and a Properties section where various file options can be set. The URL field represents the file link's href attribute, and is the relative path to the file on the server, or the full URL to an external file. The link title attribute. Used as a description of the link and will be shown as a tooltip when the mouse is placed over the link. The format of the file insert - Link inserts the file as a link and Embed embeds the file into content using an iframe. 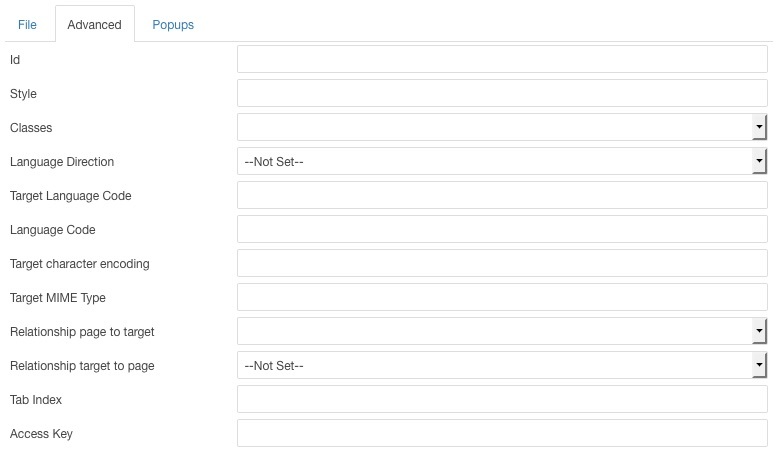 If a text selection was made before opening the plugin this field will be filled by the selection. If the selction was any other element (an image for example), the Options section (including the Text, Layout and Class fields) will not be available. If no selection was made prior to opening the plugin, a text description of the link is required for this field. Each of these elements can be re-ordered, thereby affecting the order that they are displayed in the link, by dragging their boxes from left to right / right to left. Include each element in the link by checking the corresponding checkbox. Apply additional classes to the Date and Size span element descriptions in the file link. The embed options are similar to those available when inserting an image with the Image Manager, or inserting an iframe with IFrames. The width and height of the iframe, in pixels. If the proportional checkbox is checked, changes to one value will automatically be affected on the other. When inserting a file using the Embed option, Dimensions values must be set. The position of the iframe relative to surrounding text. Represents the amount of space (in pixels) between the iframe and surrounding items. If the Equalize box is checked, all margin positions will use the same value. The Advanced tab contains fields for setting standard attributes for the file link or iframe. Unique identifier that distinguishes the element from others in the document. A list of classes from your Joomla! template that can be applied to the link. Classes can be selected by clicking the drop-down icon, or typed into the field seperated by a space.